Can the U.S. economy afford peace? 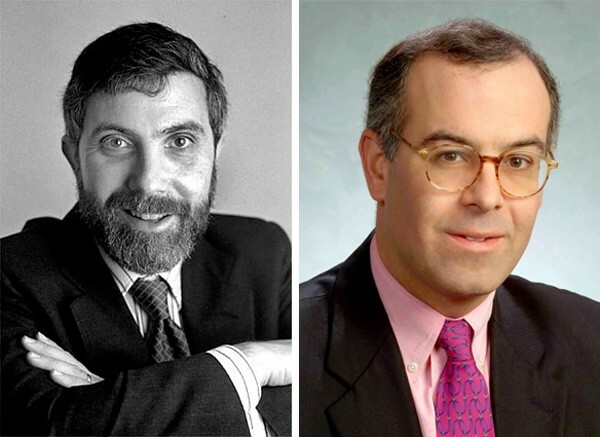 Paul Krugman and David Brooks were at it again Friday on the op-ed page of the New York Times. Krugman lamented the follies of austerity. "Critics warned from the beginning [of the ongoing depression lite] that austerity in the face of depression would only make that depression worse," he wrote. But the powers that be in Europe and too many of them in America refused to listen, Krugman went on, and that is exactly what austerity did. He didn't name himself among those critics, but their text is the one he's been preaching for years. And on the opposite side of the page, Brooks approached the subject in a loftier fashion. "In 2009, we had a big debate about whether to pass a stimulus package," he wrote. "Many esteemed and/or Nobel Prize-winning economists like Joseph Stiglitz, Larry Summer and Christina Romer argued that it would help lift the economy out of recession." Others, Brooks went on to say, thought it would not. Today, three years later, Brooks went on, "it's hard to think of anybody whose mind has been changed by what happened." Krugman agrees that big-thinking "austerians" (his term) have doubled down on their favorite theory. Krugman is horrified by this rigidity, Brooks not so much. But he regrets the lack of a "culture of experimentation" in Washington; he thinks that if Washington took a more scientific approach to governance, policy makers could figure out what works and what doesn't through empirical evidence, and perhaps the country would move beyond its ideological squabbles. And Krugman and Brooks agree on one other thing—that Krugman is the Nobel Prize-winning economist that shall not be named. In Krugman's case I guess it's modesty, the sort of modesty that leads movie stars to take uncredited cameo roles; in Brooks's case it looks like a snit. But I digress. The columns got me to wondering what the Keynsians who favor deficit spending in a time of economic crisis and the austerians who don't do agree on? Do both sides agree that it was World War II that finally pulled the U.S. out of the Depression? But what was WWII but history's greatest recovery program, one in which nobody complained that ill-managed corporations were funneled billions of dollars and idlers were handed government jobs, because the corporations built tanks and planes and the idlers were issued tin helmets and told to storm the beaches of France and Iwo Jima? There's no point in trying to find a moral equivalent of war—nobody wants to pay for none of that. We need war itself, real war, the bigger the better. A good long war could get America booming again. The thing is, we've been at war for the last 11 years or so. And here's Obama, god-almighty, trying to wind it down. Trying to walk away from the only half-decent stimulus plan we've got. Makes you wonder about him.